Stevie Starr, Finchley. © David Secombe 1990. Stevie Starr swallows things; then he brings them back up again. He is a professional regurgitator. 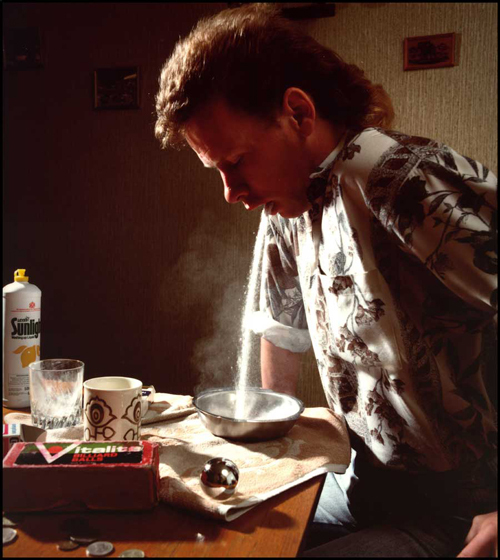 In the picture above he is bringing up a fountain of sucrose powder – which , bizarrely, is coming up dry – one of a number of different items and substances which disappeared and then reappeared before our eyes: a lightbulb, a billiard ball, coins … Another routine involved swallowing soapy water, smoking a cigarette and blowing smoke-filled bubbles. He refrained from performing his famous goldfish routine, a trick which had got him into some trouble with the RSPCA. Stevie pointed out to the animal welfare inspector who came to see his show that he drank six pints of water before he swallowed the fish, that he had never had one die on him and that, as their memory span was only eight seconds, by the time they were in his stomach they couldn’t remember how they got there. Stevie’s story of how he came to acquire such a skill was touching, if perhaps calculated; he said that he was bullied at school and had to swallow his pocket money to stop it from being stolen; he then discovered that he could bring the change back at will. I heard nothing of Stevie for many years – until last year, when he appeared as a contestant on Britain’s Got Talent. Stevie’s talent is specialist but genuine: in an earlier era, he might have become as well-known as the celebrating farting turn Le Petomane, but Stevie’s skill is perhaps too unnerving for contemporary taste. Seeing his routine close-up was a hugely memorable yet faintly worrying experience: I thought he was going to choke to death on that billiard ball.